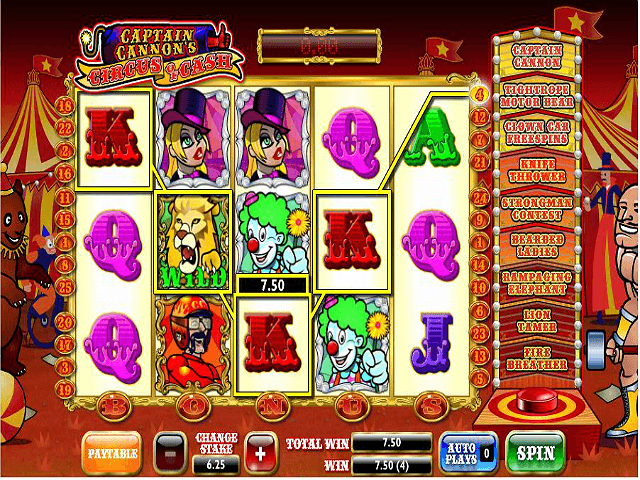 Captain Cannon's Circus of Cash by Ash Gaming is a 2011 video slot release that's a genuine contender for 'big top honours'. It features 25 pay-lines over five reels, with nine highly inventive bonus side shows and a huge range of potential payouts. 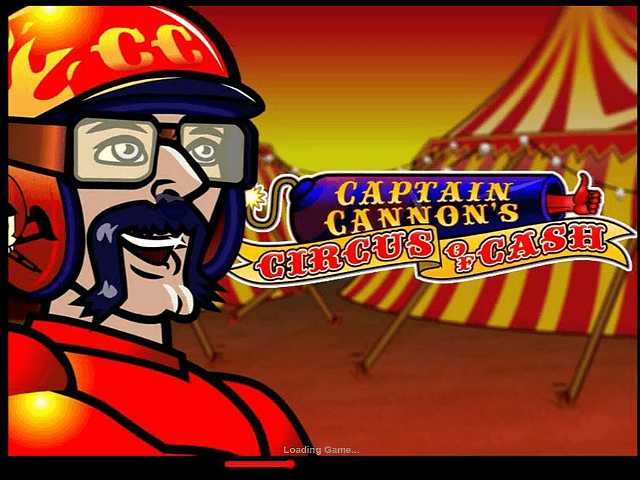 Combined with a classic British circus theme and sound effects that'll bring out the big kid in you, Captain Cannon has the capacity to entertain, while potentially paying out basic and progressive jackpots! Play Circus of Cash for Real Money! If your idea of slot gaming heaven is a game that's loaded with entertainment but also has a high level of potential rewards, then Captain Cannon from Ash Gaming is a winner. 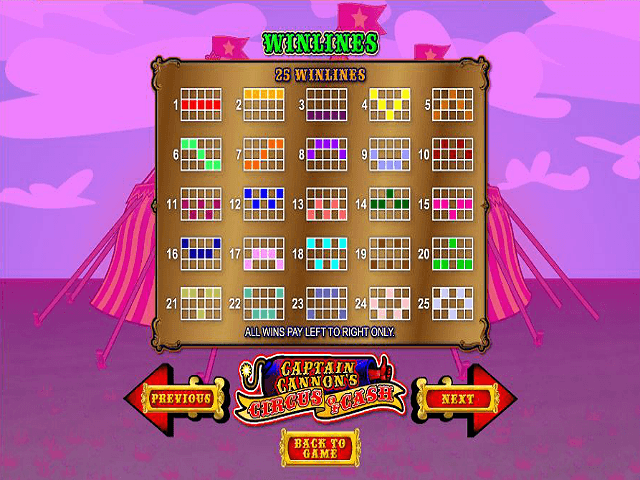 It brings the traditional thrill of the seaside circus, with a big-top slotscape packed with all the characters you'd expect, including Captain Cannon, seals, clowns, the ring girl and wild lions. This circus of cash is backed up by a plethora of bonus side acts, including bears on motorbikes, bearded ladies, lion tamers and knife throwers. The gamescape's arcade-style graphics deliver a classic seaside slot feel, but with a x5,000 basic jackpot, nine bonuses and a progressive jackpot it could slip inside a Las Vegas casino. Return-to-player levels are consistently well over 93%. *Letter and number combos pay from ten to 100 coins. Fire Breather Wild = Ignites up to three reels and turns all three symbols into wilds. Lion Tamer Wild = Whips up to five random wilds for a chance of winning combo's. Elephant Stampede = Knocks out icons and replaces them with guaranteed winning icons. Bearded Lady Bonus = Lets you give them a shave; guess right and win up to x50 multiplier! Strongman Contest = Take a punt and guess right to win a beefed-up prize. Knife Throwing Bonus = Take aim at the balloons (not those of the beautiful assistant!) and win x5 to x100 with five goes, plus bonus throws. Clown Cars = See how many clowns will shower you with green balloon win multipliers and pink free spins. Tightrope Motorbear = This beast will risk life and limb to get as far as possible along the prize rope, with six potential rewards. 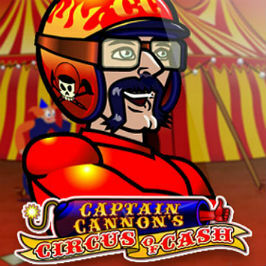 Captain Cannon = Launch the Captain and fly through the air en route to 20x to 1,000x payouts! 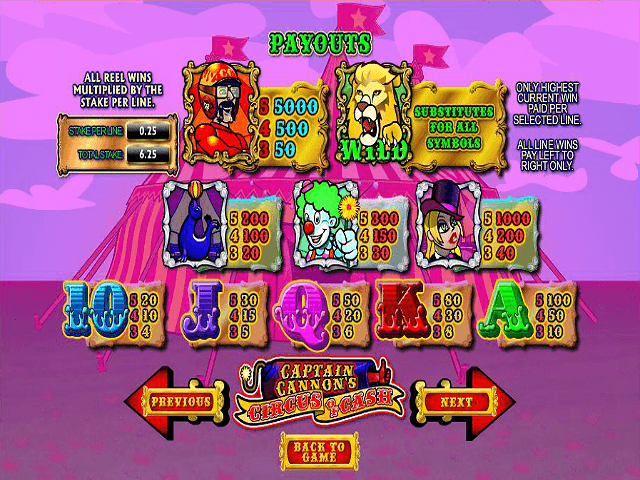 The Captain Cannon slot also has a progressive jackpot pool linked-in; if you happen to see the golden clown appear you might want to ring the boss! Ash Gaming has created a video slot crammed with action and potential payouts, while delivering the scope for big wins. Share this Circus of Cash Review today! If you like Circus of Cash, you'll love these slot titles too!